I'm going to have to check out this strength finder you mentioned, because we seem pretty similar in regards to feeling responsible for everyone else's happiness. I overplan my cruises as well, and with Anthem and Oasis coming up, I'm sure to do the same. A couple of years back, I planned a 10 night trip for 13 family members to Ireland. It ended up turning out amazing, but you can only imagine the stress of planning excursions, deciding where to eat, choosing hotels, and then hoping that everyone enjoyed them. We woke up SUPER excited the next morning to finally be in Miami. 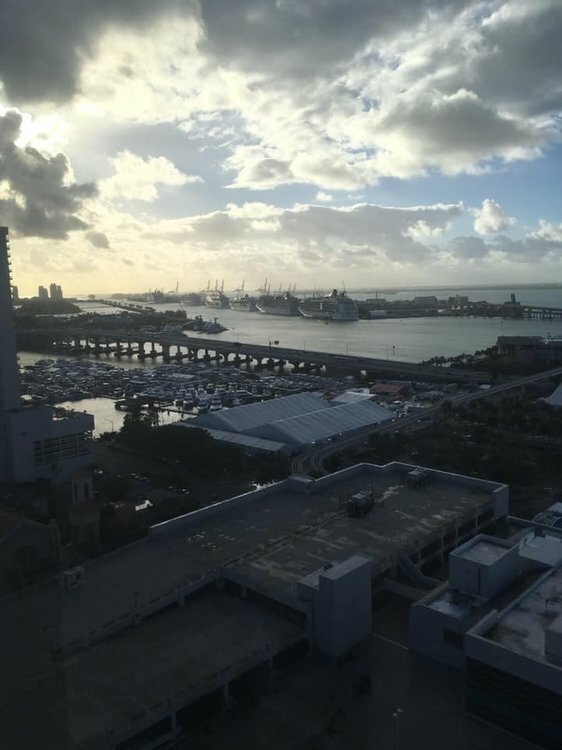 It had been a while since we cruised out of Miami and I had forgotten what a beautiful scene the downtown port area is. It truly makes for a lovely sailaway. We were still stuffed from dinner, so hubby went to the hotel Starbucks for coffee and Croissants. We figure we have way too many days of overeating ahead so why not start small. The view from our hotel room in the morning was lovely as we saw all of the ships lined up. It is so fun to wake up to that sight. We left our hotel at about 10:45, and got an Uber to Terminal A. Uber was at the hotel at 10:52am and cost was $8.71 with a $4 tip. For years of cruising, we always bring our swimbag on the ship as a carry on. We start our vacation right away at the pool. We can always find chairs and we love feeling like we are on vacation from the first second we are on the ship. I have cruised enough to know that I don't really need to find things on the ship, I generally know where they are. At about 1:30, the ship announced rooms were ready. My hubby was very unnerved about not having our cards and having them out where people could get them (The gall of Royal) and had to run right away to get them. I stayed in my chair with my newly purchased pina colada and took in the sun. My opinion on the cards being on the door - it doesn't bother me. I don't really think someone is going to steal them, much like I have left my beach bag on the chair while in the pool and no one has ever rummaged through my bag. if someone legit needs to use my card for a drink before I get to them, well then, I might say something or I might not. Maybe that person needed that drink more than I. Or maybe I spent the money on the extra drink and didn't realize. By the way, we used our folio without needing our cards before we got to them anyway and the needed our deck and cabin number. We are in cabin 715 on deck 11. 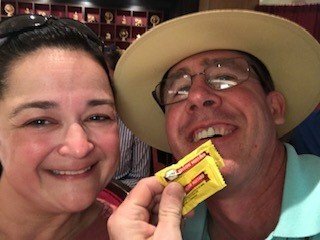 We ate lunch around 2:30ish with hubby realizing the Roast Beef sandwiches on deck 8 were indeed amazing as he brought sandwiches back to the solarium with him. He mentioned that baggage was just now being set out near our cabin. At 3, we decided to head to Vintages to meet staff there and sign up for wine tastings, then to the room. Along the way, we found our luggage in the hallway and were able to take that to our room. Unpacking took about 15 minutes, I took a shower and was ready in time for Muster. We have our unpacking strategy after cruising for a while. Hubby handles hangars and closet. He handles clothing drawers and I handle all the toiletries, and organization of the space. oh you have to do strengths finder - I think it costs about $20. Of my top 5 strengths I agree with all of them, but I find the responsibility strength to be my burden and not as much of a blessing. 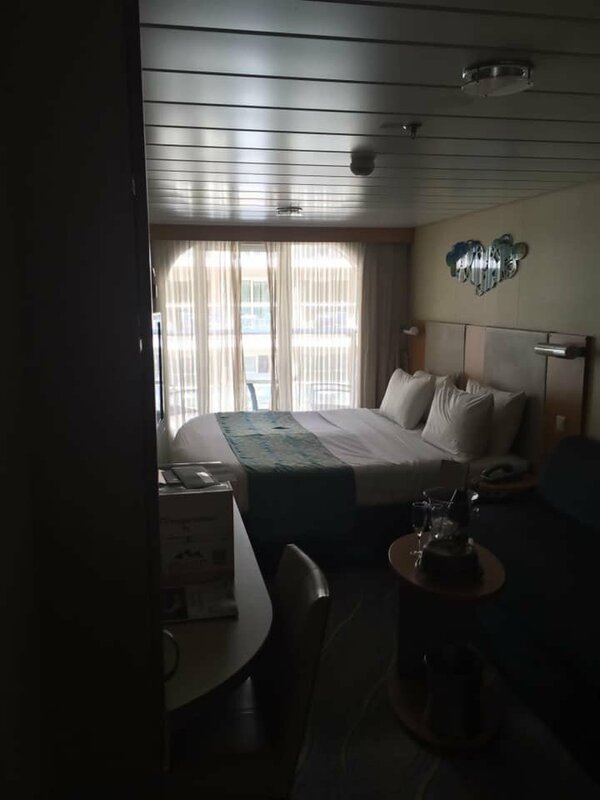 I am also a rule follower and time keeper because of that, which super stresses me on a cruise. On our Oasis cruise in 2017, I organized the whole thing. I had a group of people (family and friends) planned a prestay at Walt Disney World and a day at Magic Kingdom. I was so sad when my sister didn't love WDW as much as I do. But now she tells me she wants to go back and try Epcot, so we will see. I used to work for Gallup! They take their strengths finder very seriously. I am planning a pre-trip WDW visit as well. how did that work out for you? I was thinking 3 Disney days in the week before our cruise since we have our ILs time share in Orlando and my kids are out of school since it is during summer. I am definitely the over planner and my entire extended family expects me to take care of all the details. We are going on the Allure in April. We are lowly Emerald members:) This will be the first time we have back to Royal in quite a few years. We have tried Carnival, Disney and Norwegian. We aren't crazy about Carnival, Disney is quite pricey but we do love Norwegian. When we go on vacation we make the best of any situation and will always enjoy our cruise. We are looking forward to returning to Royal and seeing the Allure of the Seas. If you have any advice for this ship, please let me know. You know, its a lot to do with a 7 day cruise, but I love going there and then having the cruise time to rest from Disney. I have done this twice in the last 4 years. The disadvantage for us is the cost. We are retired military so have access to the 4 day military passes which is a HUGE money saver. However the last two times we did this precruise we just did one park day, so its better to buy the one day pass through WDW which isn't cheap. Since we did just one day, we also spent extra to stay on property to take advantage of WDW transportation, extra magic hours, and we planned to exhaust ourselves in that one day. If I had the luxury of time, I would do several days then the cruise. When we did it in 2017 with my sister, we flew in Friday, stayed at Port Orleans Riverside and rented a car. We spent Friday afternoon at the hotel in the pool, then to Disney Springs for dinner. Early night to bed. Up super early to be there for rope drop and then breakfast at Cinderellas Royal Table with fast passes for Space Mountain, Buzz Lightyear and Mine Train. That day was so HOT we could not make it to Wishes (or whatever its called now) and went back to our hotel at 6 for pool time and dinner. If I had to do it over, we would have skipped CRT and then gotten there later to enjoy the night stuff. Then we drove to the port the next morning for our Oasis cruise. Returned the rental car just down from the port. Its a lot of extra expense to do WDW! And yes, Gallup Strengths finder helps me so much at work and personally. What are your 5? Mine are Developer, Empathy, Belief, Responsibility and Communication. Expect that you won't be able to do it all on the ship and take in the pieces that are the most important for you and your family. I have cruised on all of those lines but Norwegian, and agree about Disney. Part of an ongoing family joke from 2005 when our 8 year old couldn't quote grasp the word muster and called it mustard. Every cruise we say, where is the mustard drill at? And the 8 year old (now 22) is sent on a goose chase to find mustard packets before muster. We are a confusing family but it works for us. By the way, she won't go looking for mustard packets anymore! Our Muster station was on Deck 5 dining room. We walked down just before the drill and I really wish Royal would update that hokey spy video with the golden bear. It didn't work for me on Oasis in 2017 and still doesn't now. I did greatly appreciate the wash your hands cartoon that preceded the video! 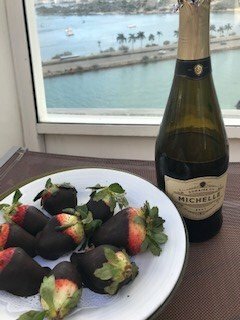 I love traditions, and our sailaway tradition is to head to the pool deck immediately after the muster with our preordered bottle of champs and chocolate covered strawberries. We do this every single cruise. We watch the view and the sailaway while we much on our strawberries, drink our champagne and take a few photos. 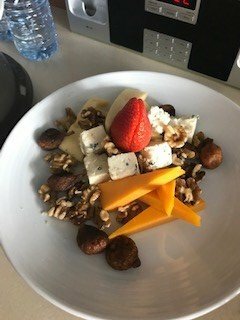 This time though - our 22 year old back at home had preordered and sent us a cheese plate as well for our sailaway. She can be a sweet kid! However, she can also be a pain. As I was instagramming my amazing view, she had to slap back. Now she did have to shovel, but she has grown up a bit princess like and she can handle it! She is 22 years now, not that sweet little 8 year old who didn't know the difference between Muster and Mustard. We were at table 416 with Thomas as our waiter and Ryan as the assistant waiter. Good job to Royal here. I noticed a huge difference in wait service from my last few cruises and this was the first time in a long while that we saw the head waiter (Tony) every single night. The entire wait staff was perfection, and so personable. We were at a table for 6, and met our 2 other table mates from Canada. The 3rd couple never showed up. Food quality was improved a bit as well from our cruise on Oasis though menu selections appeared to be the same. After dinner, we went with our new Canadian buddies to Vintages and had a rousing great time with the Vintages staff and wine. Daniel. Boijan, Marco and Gemma were incredible and they kept us entertained at the bar. We might have also kept them slightly entertained as well! We had to get to bed so that we could be up super early to be the chair hogs that we planned to become on this cruise. I have read the stories, so yes people, I came to play and get that preferred chair and hog it with my towel all day long! Next up: 2 sea days, chair hogging and did we or didn't we see Mamma Mia? Allure is my favorite ship. I am also an over-planner and when I am with the family that are my cruising partners, I drive them crazy. My husband never minded how I obsessed about shows, dining etc. but I don't think he much minded anything I did. Thank God for him. I now cruise with my sister in January and I am in charge of everything. I cruise with my son and his wife and my granddaughter in June/July and once again I am in charge. I start planning the minute the cruise is booked. My sister has cruised enough with me to know how I am, and when she and her husband cruised with me and DH, all was ok. Her husband doesn't like cruising as much as she does, so she sails with me and her husband does golf trips. My son and daughter-in-law let me talk, even though I know I drive them crazy, but they also know DH and I did many, many cruises so know something about a lot of the ports. I am enjoying your review and looking forward to more. Thanks for posting. PS I am now planning a trip to England Scotland in 2020 with my son and family. Such fun, but I know I will drive them crazy. What fun! My daughter went to England in 2017 by herself! Yes by herself at age 20. She is obsessed with British Monarchs and had the best time. I overplanned for her until she said - mom, its not your trip. Still annoyed she didn't go to Portobello Road. I seriously sing that sing from Bedknobs and Broomsticks all the time when I think of London. Her hotel was literally 3 blocks away. 2 sea days, chair hogging and did we or didn't we see Mamma Mia? okay - so a small confession - I am Broadway Musical obsessed. I see almost everything when it tours and will travel to see a show. On our trip to NYC this spring, we saw 4 musicals in 4 days. We have seen 3 in 2 days in NYC before. BUT - I hate most musical to movie interpretations including Mamma Mia. I thought the musical was fun and didn't feel the movie had great singing or was as dynamic as the musical. Yes, I bow at the feet of Meryl Streep, but she frankly cannot sing. I will say that the sequel to Mamma Mia from this summer was fun like I wanted the Mamma Mia movie to be, and had great singing. So I was excited to see Mamma Mia on Allure. I made my reservations early and told hubby - that HE HAD NO CHOICE but to go with me and enjoy. He is not a musical guy, but tolerates our obsession. He did love Hamilton though - and I was convinced he might like Mamma Mia - more on that later. We all have our opinions on chair hogs and I will turn their asses in all day. However, I am not an early riser. I much prefer sleeping to getting that pool chair early. But its okay - hubby is up every day early and he promised to snag our chairs by 8am and then let me join him when I was ready. I got him the internet package so he could keep up his social media arguing (don't ask, but he loves politics and I am so over it.) So day 2 is our first sea day, and at 8:15 I woke up and realized he was solidly asleep beside me. After sitting up in bed and staring at him with total disdain (duh, we were going to lose our precious solarium chairs) he woke up (sensing my stare) and immediately left for the solarium. I left the cabin at about 9, and met him where he was waiting in the solarium with my coffee. The problem with this, it was that Seattles Best crap, and not doctored enough for my taste. We sat on the chairs together for 30 minutes, then went into the solarium cafe for breakfast. We were back into our chairs within the 30 minute time limit (remember, rule follower here) and then I sent hubby to starbucks for normal tasting coffee. We sat in the solarium until 2 - then I went to the cabin to shower and change for our 3pm Italian wine tasting in Vintages. I do like the wine tastings there, but do wish they would move them to 4 so I could get more time by the pool. It was formal night, and we had our Mamma Mia reservations for 9:30. We had 8pm dinner and hit up the diamond lounge at 6:30. It was quiet and our favorite waiter was there from the night before. We tip between $3 and $5 for drinks in the lounge and typically spend $10-15 a night in there on tips in case anyone was wondering. Chester and Francois were our favorite waiters and they did an amazing job. I love the dessert on formal night - the Gran Marnier Souffle, and I will get several instead of other dinner options. After dinner, we went to the theater to see Mamma Mia. Found seats and just after I sat down, I started to feel sick to my stomach. I knew I had to get out of the theater, and got out in time to get to the bathroom. Hubby texted to see if I was okay, and we had to head to our cabin. I know he was VERY disappointed to miss the magic of Abba and I don't know how he will live now having to miss that. Just as an aside - about 2 weeks before we left for the cruise I had a bad bout of food poisoning. I ended up in the hospital with dehydration and low pottasium levels and my stomach has not been the same since then. I don't think my issue that evening was norovirus or anything simply then something really didn't agree with me, and my body lately was used to reacting in a very particular way. We always clorox wipe our cabin and religiously wash our hands. Admittedly, that night I was worried, especially since I was not drunk or tipsy. I was fine the next day, kept my distance from others and didn't have another issue the whole cruise. My diet did become a bit more bland after that. I tried to see if we could reschedule to another showing of Mamma Mia, but we were out of luck. I know hubby was VERY upset about missing it, especially after I made him listen to Abba in the cabin the next day while we were getting ready for dinner. Up next: 150 Central Park and what on earth is there to do in St. Maarten? What a great review so far! My husband and I are sailing on the Allure 3/31, Western route. Because Royal's website is not the greatest, I spent two hours on New Year's Day planning shows, My Time Dining and specialty restaurants. It's unfortunate to not be able to do things on the fly ... need a ticket for everything! This will be our first time on Allure; been on Oasis 4 times as well as Voyager and Freedom class ships. Disney twice - on our last Disney cruise, we were bored - not enough for adults. 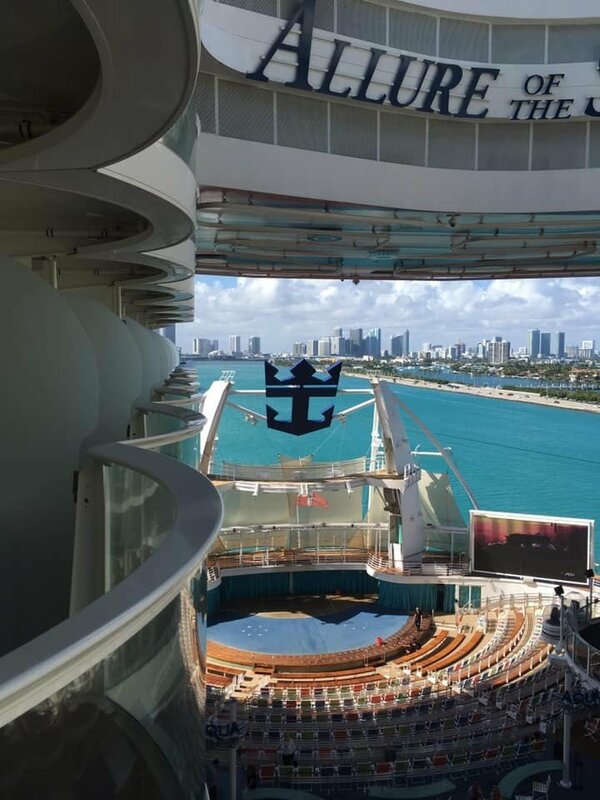 We cruised with family, so that kind of made up for it. Look forward to the next installments! 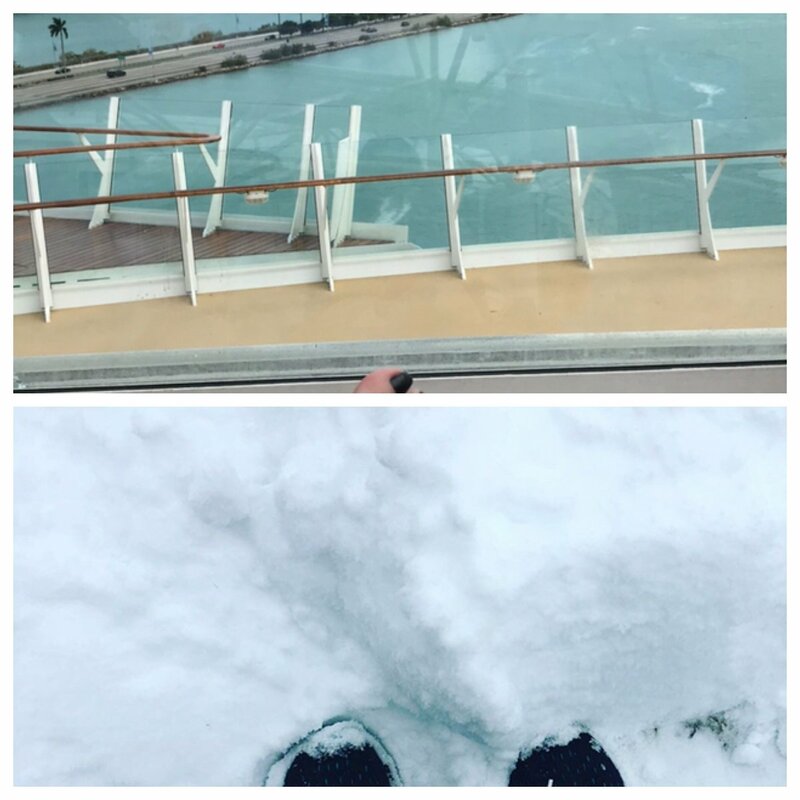 We are on the same cruise as you 🙂 I am an obsessive over-planner, and we have a group of 10 adults ranging from 47 to 80 yrs old, so I hope everything I have planned goes as scheduled. My mom has been doing chemo since January and has had persistent pain in her leg so has been using a wheelchair lately. I am concerned about how this will affect her cruise and her overall enjoyment. We will make it work somehow!! 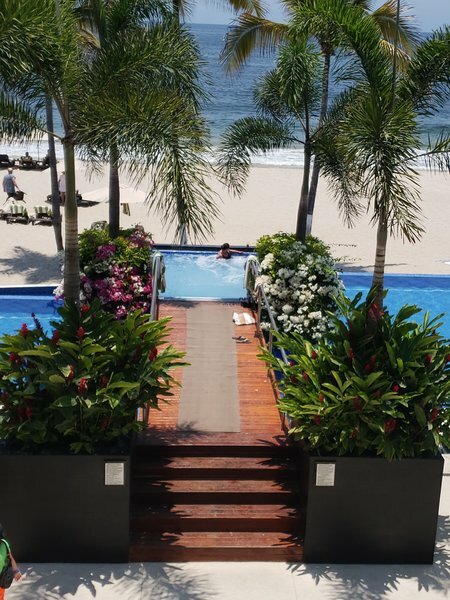 Tuesday, February 12 was our 2nd of 3 sea days, and we spent the day much like we did the day before. Laying by the pool and then wine tasting at 3. We had reservations for dinner at 150 Central Park at 8, and we had previously enjoyed our experience on Oasis. 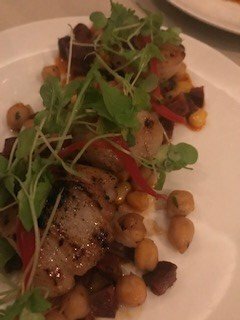 We were looking forward to the salt tasting but when we arrived we found out that Royal no longer had a relationship with Chef Michael Schwartz and had revamped the menu a few weeks earlier per our wait staff. 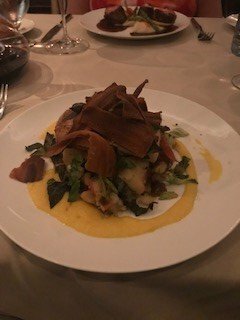 The setting for 150 Central Park is lovely, and the food is still amazing. We did splurge and purchase the bottle of 2014 Caymus Cabernet Sauvignon. We started with the Scallops. Our waiter was kind enough to bring us an extra! 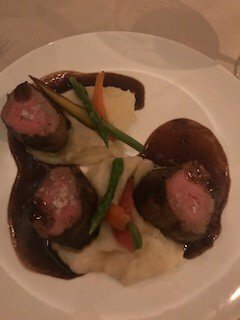 Then hubby had the halibut and I had the veal. 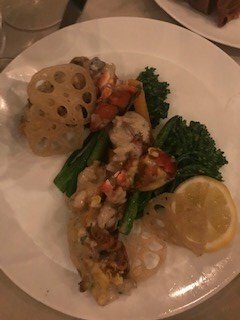 Then our waiter brought us the Lobster Thermador. This was absolutely the best taste of the night! 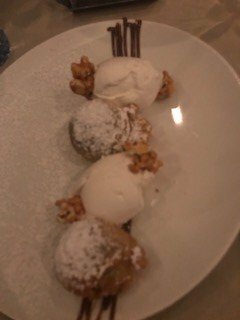 Last - dessert - I had the fried cheese cake. So good. Hubby always gets chocolate ice cream. Its his thing because I don't buy it often at home. We don't bother taking photos of the ice cream, because you know what chocolate ice cream looks like. I did mention to the waiter that the caramel popcorn was delish and he offered to bring me a bowl of it. I declined because it was so full. But it was good. 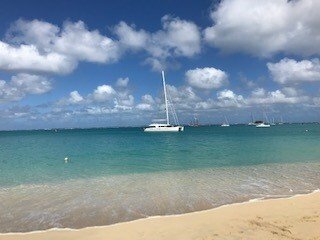 We had an early morning with our plans for St Maarten so we went to bed with full tummies! 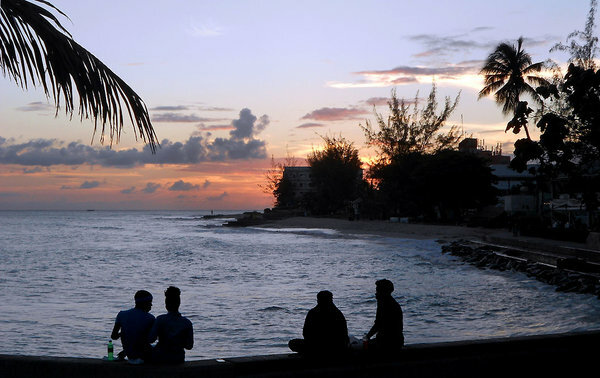 We had made plans with Bernards Tours for St Maarten. I had used this company when I was in St Maarten in 2016, and knew hubby really wanted to go to Maho. I was more curious as to how the island was recovering post Irma and knew this tour company would give us good perspective. We met our tour group by 9 ships time and were shortly on our bus driving around the island. Mailman was our tour guide and he did such an amazing job with explaining the Dutch and French side, how the two cultures live and work together and also discussed the economics behind the hurricane recovery. 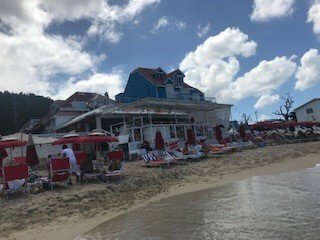 Mailman mentioned that they used to take guests to Orient beach (which we had been too before) but every restaurant and bar was wiped out in the hurricane and has been slow to recover. He said they no longer take guests there for various reasons which include guest complaints about the places that have reopened. Instead we went to Grand Case and the beach venue - Rainbow Cafe. The food and drinks were incredible. The view and beach were perfection. 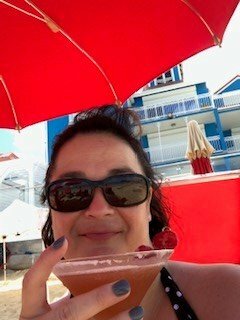 Yes a beach martini at 11am! View back from beach to Rainbow Cafe. Oh and NO ONE was selling goods on this beach. After our time at the beach we went to Marigot. I love Serafinas, but its still gone. 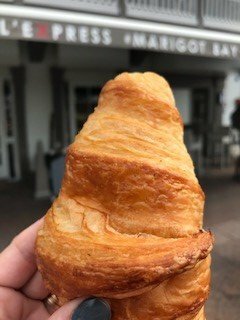 After walking through the market, we got croissants. Quite good. Then it was time for Maho. I think its very dangerous and had been there before so I sat at the bar. Hubby made sure to get right into the action and he loved it. I think Maho is worth a visit once, but I don't need to go back there again. Our tour with Bernards was $45 per person and we did tip. The beach cost us $15 for two chairs and an umbrella. I want to say the food and drinks were about $30 plus tip. I think St Maarten is a beautiful island, and I wish them well in their rebuilding effort. I wish more people from the ships would do tours to learn more about their island culture as it is so unique. Many that we talked to just did shopping by the port or in Phillipsburg. There is so much more to this beautiful place, and our experience with Bernards both times we have used them has been stellar. It really is a beautiful island. One of my favorite stops! Really enjoying your review. Thank you for taking the time to share with us. 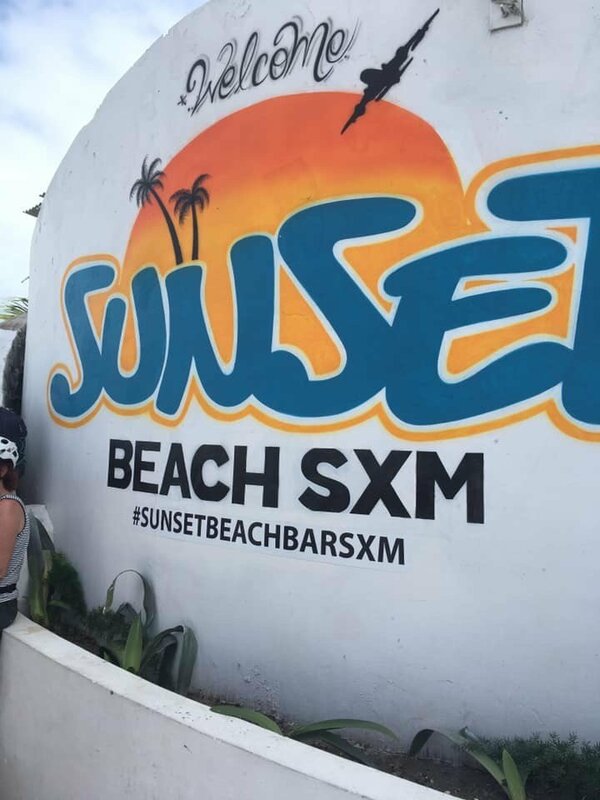 Love St. Maarten and am truly sorry they are having a difficult time rebuilding. 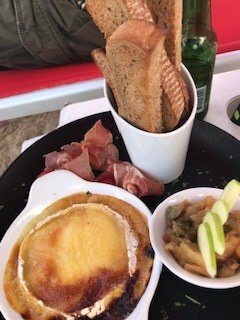 We used to spend the day at Le String on Orient Beach - the people that ran it were so nice and the food was very good. I think the french side is hurting a bit more on that front. The insurance claims process has slowed things significantly. Claims have to be sent through the island of Guadalupe first for processing, then to France for approval. Once approved the funds are released back to Guadalupe and then to St Maarten. We noticed quite a few overturned and torn apart boats in the harbors as well. I assume there has to be a time limit on that clean up but if doesn't seem to be enforced if there is for now. Despite my best intentions to plan reservations for shows ahead of time, I never checked the calendar in the cruise app, and I missed most of them. However after our dining room dinner on St Maarten day, we went to Vintages for a glass of wine. We had a great talk with our bartenders there about their home countries, a bit of politics and movies. I do love the shows, just didn't make it a priority to get to them this time. When we got back to our cabin, the aqua show had started about 5 minutes earlier, so we sat on our balcony and watched some of it. 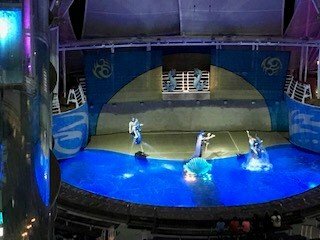 I liked the aqua show on Oasis, and we had a good enough view from our balcony here. I'm a Marvel girl, not DC. So this looked a little like Aquaman to me. My mom's side of the family is all from Puerto Rico, and I love this island. I am always so disappointed on a cruise stop because the time in San Juan is just too short. My heart was torn when Puerto Rico was hit by two category 5 hurricanes in 2 weeks. I have family and friends in other areas of the island who are still having difficulty with consistency of power and water, rebuilding homes and lives. 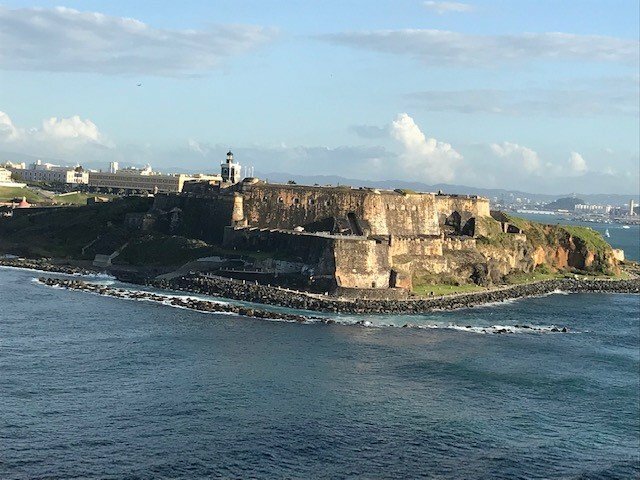 I was thrilled when I saw in the shore excursion planner that we could do a volunteer activity while we were in San Juan and my hubby immediately loved the idea of that. Plus our stop in PR, our 14th wedding anniversary! When we had gotten back to our cabin The night before, we had a notice from Royal that our tour was cancelled due to lack of participation. 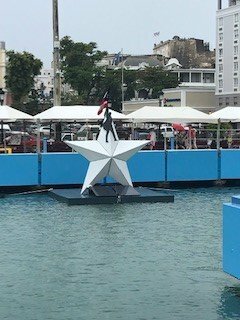 It made my heart sad that we could not do a volunteer activity, but I was still happy to get off the ship, explore and help the economy in my own way. 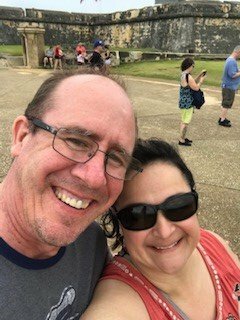 We decided to walk around for a bit and then hubby really wanted to go explore El Morro - again. I do love going there. Its an amazing place, and such a marvel of building and defense. Was this still there because of Hamilton? Cmon - where are my true broadway fans!? 14 years and we still like each other! 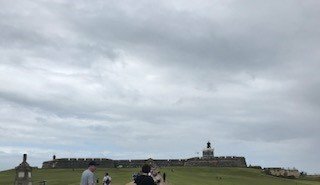 After walking around El Morro, we decided to head back into town and get lunch. 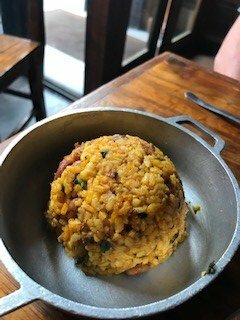 We stopped at local restaurant Raices restaurant at 315 Recinto Sur in Old San Juan. 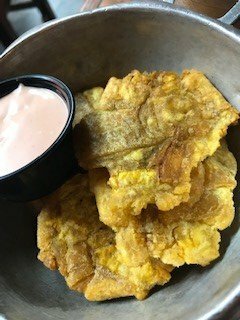 We ordered fried pork and mofongo. 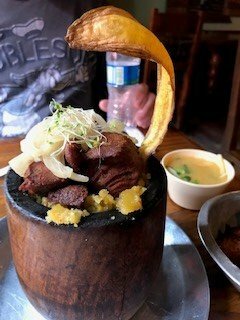 If you have never tried mofongo - it is heaven and made from fried green plantains mashed and seasoned. 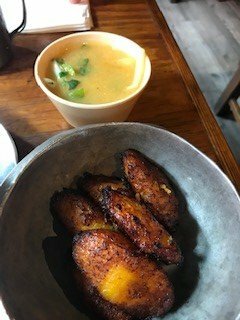 The fried pork was beyond delicious with platanos, rice and beans and tostones. Sorry, I am a food picture person - so here you go! The food was so good. When we later got back to the ship, a lady told me the Subway in San Juan wasn't as good as the one near her home. This happened 2 days after the Norwegian Epic smashed the pier in San Juan. I am sure you have seen that video by now, so I won't post it. 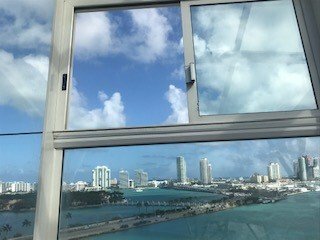 I did wait in the solarium for the ship to leave because the San Juan sailaway is a beautiful thing to see. Thanks for writing the review. 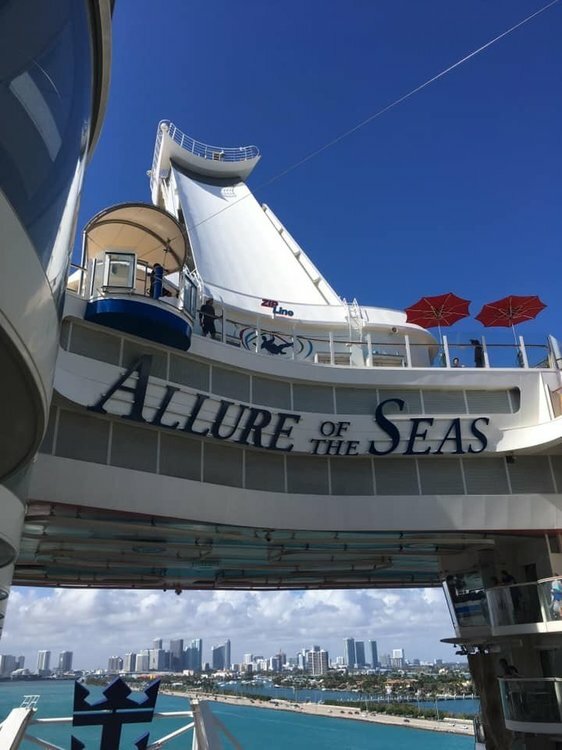 We are sailing on Allure in April on the same itinerary as you. Booked on Bernards Tour as well so looking forward to it more now and think we are also just going to go off on our own round San Juan. Looking forward to your next updates!